To receive Emperor's Clothes articles by email, subscribe to the TENC Newsletter. Just send an email with SUBSCRIBE in the subject line to emperorsclothes@tenc.net And please add emperorsclothes@tenc.net to your personal address book. Our readers make TENC possible. Jared Israel spoke in English with a simultaneous Serbo-Croatian translation; watching the video (see link below), one hears both. I. What are the characteristics of Fascism? V. Are the PLO and Hamas fighting for national liberation or a modern form of Nazism? [Time on video] 6:18 – Siniša Mihajlović: Mr. Israel, you have been working as a journalist for a long time, and you are very well informed about Fascism and all its forms. You know about these forms of Fascism, and our people may not know enough about this. So, how was Fascism, and also the idea of Fascism, started, and what are its characteristics? 6:42 – Jared Israel: Well, that’s a very big question. But to take the most developed and advanced, so to speak, form of Fascism, which is Nazism, and the variations, such as the Ustaše in Croatia and the Fascist movements in the Baltic states and so on: at the heart of that Fascism is a mixture of racism, intense racism, especially against the Jews, but not only against them, and, secondly, often religious fanaticism – especially Catholic fanaticism with the Ustaše and in the Baltic states, in Slovakia and so on – often clerical-Fascism. So we have a mixture of clerical fanaticism and also this intense racism, especially, foremost, directed all around against Jews, and then in various areas directed against other groups, especially against Slavs and Roma. So in the Baltic states against Russians and in World War II Croatia of course against the Serbs. 8:05 – Siniša Mihajlović: Oh, yes, I do. How is it possible that an idea like that, in that moment, could find supporters among intellectuals in a society? 8:25 – Jared Israel: Well, in many cases such intellectuals are dead. I mean, that’s what happened in Germany. Many intellectuals did oppose the Fascist movement: the Communists opposed it; the Socialists opposed it; and a segment of the Center Party, which was the Catholic party, the left of it or the antifascist part of it, opposed it. And many of them ended up killed very quickly. The Communists first in Germany in 1933 were killed, and then many Socialists, and so on. I think the other side of the question is, ‘why would masses of people fall for this?’ Because the ideas of racist Fascism, of clerical-Fascism, are such nonsense really. So these ideas were put into people’s heads over and over in a million ways by this movement that developed long before there was any Fascism. So that the ground was ploughed and watered, whatever, you know, the basis was laid. And that’s the critical question. And many people of course did oppose Fascism, and many people died opposing it, I mean, that was one of the things that happened. Germany was not a country of reaction. It was a country which was viewed as the most progressive in the world. And one of the things that the Nazis did in Germany, of course, was they destroyed German culture and they eliminated it, literally, by killing many of the finest people, and so on. If I can please ask you – that part about World War II – to go back to that, the idea of Fascism, Nazism, and all that hatred in this area. We saw recently the commemoration of Jasenovac [the Croatian death camp]— how many people died among Jews, Serbs, and Roma in a quisling country like Independent Croatia, which was born and developed based on the idea of Fascism. I would like to ask you how you look at that idea. How was it possible, such a systematic killing of everyone who was not Croatian? And is that idea new, or is it something which has its roots in history? 23:25 Siniša Mihajlović: Mr. Israel, what kind of neo-Fascist, Nazi, or neo-Nazi groups— in what form do they exist in the world today? 23: 42 Jared Israel: You do ask big questions, don’t you? I want to say something else about Croatia, because I do a lot of research in the past media, studying the newspaper reports from the time. You find a lot from that. And one of the papers I use the most is The New York Times, which is a very authoritative source from the West. And I have— this is a— I don’t know if you can see it, but this is the headline of an article in The New York Times, in February 1941. 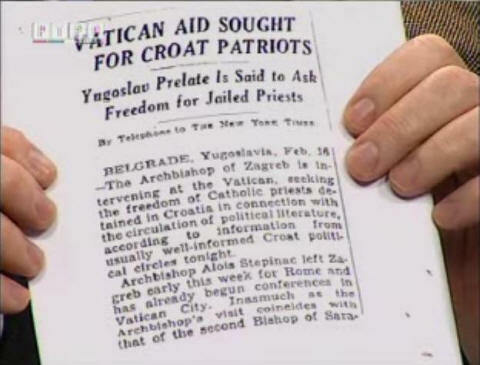 24:18 – The camera shows Jared Israel holding a copy of a newspaper article with the headline, “Vatican Aid Sought For Croat Patriots. Yugoslav Prelate Is Said to Ask Freedom for Jailed Priests. By Telephone to THE NEW YORK TIMES. Belgrade, Yugoslavia, Feb. 16[, 1941]” (capitalization as in the original). 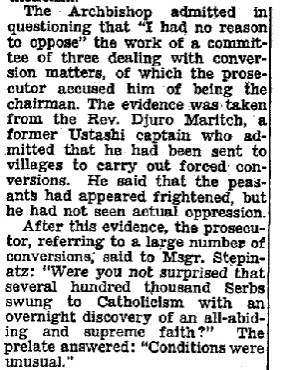 Headline and excerpt from the 1946 New York Times article reporting Stepinac’s casual confession. I am going a little too fast for my translator. Should I begin that paragraph again? OK. OK, I am being talked to by— I am being scolded by my translator. I’ll paraphrase it then. What the article says is that, while certain Fascists groups have been bombing Zagreb at this time, the particular group, Pavelić’s group, the Ustaše, is not the one that was just arrested for bombings; it’s a different one. And that’s the group that the Catholic priests have been distributing literature for and were arrested in connection with. So, if that was said after many years of Communist rule, imagine what it was like in 1941, when there was no opposition in Croatia, effectively, to the Catholic Church. And the Catholic church was inspiring people by having priests actually distribute the literature to support the Ustaše. Now this is straight out of the Fascist and Nazi propaganda of the 1920s and the 1930s, where the “Antichrists” means ‘the Jews’; it’s just a code word, because if he says ‘Jews’ he’d get in a lot of trouble. But when he was in the Netherlands and he was asked about the cancellation of his concert he said, ‘Well, the people who canceled it killed Christ, so how can we expect them to be nice to a little man [such as I am]’. So we can figure out whom he is talking about; it’s not a mystery. So this is just a very modern, very effective form of Nazi propaganda. And it’s not just some neo-Fascist groupings, this or that neo-Fascist – every country has problems with these people – this is being promoted. He had a concert July 2007 – I think it was July 1 – on July 5 it was promoted on television in Croatia. [Correction: the concert was June 17, 2007; it was televised on July 2, 2007.] There was some opposition to that, and the board that controls the TV station, the board spokesperson, made a violent antisemitic speech, you know, blaming all problems on the Jews, and so on. 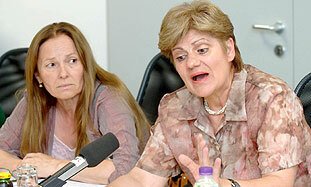 Picture of Jadranka Kolarević (on the right), a member of the HRT (Hrvatska Radiotelevizija – Croatian Radio-Television) Programming Council and president of the Croatian Consumers Association, denouncing ‘the Jews,’ following criticism of HRT for televising Marko Perković ‘Thompson’’s June 17, 2007 concert in Zagreb, Croatia. Among other remarks, Kolarević, who boasted of being at the concert, claimed World War II Croatia, which murdered most Jews, was actually run by Jews, and she attacked Israel as genocidal. 32:58 – Siniša Mihajlović: Mr. Israel, what I would like to know is how much do you write in your articles in Israel about all of these things that are happening, and how many people in Israel know about Yugoslav history and the wars in this last century – the First and Second World Wars and the war in the ’90s? 33: 27 – Jared Israel: Well, I write for a widely read [Israeli ] website, which is actually somewhat different from me politically, but which reaches a lot of people, which is called “Arutz Sheva.” I write for an English website that I edit, which is called “Emperor’s Clothes.” I do talk about the conflict in Yugoslavia. I am not in a position to judge overall how much people understand [in Israel], however I think [people understand] more in Israel than in most countries, I would say. I think that Mr. Livne is in a much better position to judge that. 44:55 – Siniša Mihajlović: Mr. Israel, I would like to know if there is any trace of Fascism in the conflict in Gaza because I think that conflict could become a much broader problem than it is today. I think that there is a manipulation of Fascism. And I think Mr. Livne’s point about the United States having instigated the Iranian situation [Livne had said that the U.S. brought the Ayatollah Khomeini from France to Iran in the late 1970s] is true and very important to understand. I have studied that also, and people don’t seem to— are not aware of it. I think that’s very important. But just to— the problem as I see it is that the situation in the Middle East is multi-layered. On the one layer we have the apparent demand for a national state. And yet the Palestinian movement continually avoids the opportunities to have a Palestinian state as, for instance, they could have had ten years ago with Barak: they had almost everything they wanted, and they refused and instead instigated violent actions. I don’t think that the goal is to have an independent state. I think the goal is to destroy [Israel, which is] the second level; that is, a stated goal, both of the PLO forces of Fatah (which is Arafat, you know, the group that Arafat was the founder of) and of Hamas, is the destruction of the Jews. And [I think] that they have pursued that consistently, with different tactics. As soon as Israel won the 1967 war and took these areas from which they had been fired on – because they [i.e., Arab gunmen] were firing on kibbutzim from these areas as part of the provocation that was going on – as soon the they [the Israelis] took control of these areas, then the PLO discovered that they were a nation in these exact areas. Even though, explicitly, the national demands had been only [concerning] Israel proper before that, now the national demands were about the West Bank and Gaza. So, this is movable state, in which— [Jared pauses here as the translator speaks to him via the mike attached to his ear.] Am I going too fast Mr. Translator? 48:31 – Siniša Mihajlović: What does that actually mean? Does it mean that somebody just wants a perpetual war in that region, or does it mean that when we have all these people and organizations trying to destroy Jewish people— does it mean that it’s a Fascist movement? 49:13 – Jared Israel: Well, you are raising two very big questions. On the first question, the question whether there are forces that wish a permanent war, I think that different forces wish different things. I think that overwhelmingly the Israelis want peace. Somebody made the joke that if the Arabs disarm, there would be peace tomorrow, and if the Israelis disarm there would be no Israel tomorrow. So you see, [one leads to] no war, [the other leads to] no Israel. Israelis want peace, [Israelis] of all stripes, all political [sides]; they want to be left alone. There are many different segments of Arab society which do want to destroy Israel and I think there are outside forces that are fishing in troubled waters for various motives, at various times, for various reasons. People often forget that before the PLO came back to the Middle East – and [unfortunately] Israel welcomed them back – the Israelis had negotiating partners in the West Bank and Gaza with whom they were working and who acted in a civil fashion. And— a little too fast. [I.e., the translator had just said, in Jared’s ear, that he was going too fast.] Before Arafat was brought back to the Middle East and was made Israel’s negotiating partner, the Israelis were working with people in the West Bank and Gaza who wanted— who had disagreements but wanted to live in peace. Arafat killed many of them when he came back. This bringing of Arafat [back to the Middle East] and making him the partner – the man who called for the destruction of Israel! 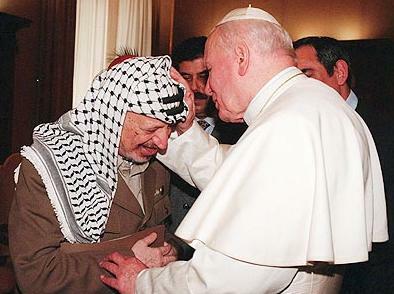 – the partner for peace, was forced on Israel by the United States and the Vatican, primarily those two forces. So, you have both a propaganda of Fascism, I think, because a lot of the propaganda found among Palestinians both from Hamas and the PLO is straight out of Nazi propaganda, Protocols of Zion, you know, images of Jews that could be from Der Stürmer, the German Nazi publication in the 1930s, Jews feasting on dead people and so on. This is pumped into the children in this area and it is Fascist in my opinion. But at the same time [there is] a manipulation by very, very powerful forces who promote these people. These are not Arab stories. These are not stories that originated from Muslim society. These are either old, Catholic antisemitism, or Nazi stories. So, I think there is Nazism, but I think also people— powerful forces [are] fishing in troubled waters. 55:10 – Jared Israel: And I think powerful forces are fishing in troubled waters in Yugoslavia. 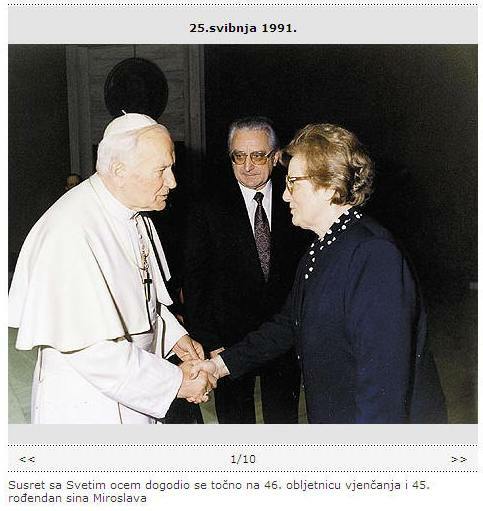 I personally do not think Yugoslavia would have had the problems it had, if the Croats had not been— I have a picture of the pope celebrating the wedding anniversary of Tuđman and his wife in May of 1991, one month before [Croatian secession]. The picture shows Croatian secessionist (and, in our opinion, clerical-Fascist) leader Franjo Tuđman (pronounced ‘Tudjman’) and his wife Ankica, meeting with Pope John Paul II. Re-published in 2006 on the website of Vecernji List, a leading Croatian daily, the picture originally appeared in the very important month of May, 1991. Why “very important”? By having this very personal celebration, the pope was intimately endorsing of Franjo Tuđman. But that was not all. On June 25, 1991, Tuđman’s pro-Ustaša government would announce Croatia was seceding from Yugoslavia, thus launching the Yugoslav wars. By providing an intimate photo op at this critical time – one month before secession – the pope was telling ordinary Croats and the world: “The Vatican is with Tuđman,” thus giving visual support to the propaganda claim made worldwide, that the Tuđman clique represented the pope, meaning Christianity, against evil communist Serbs. Following Croatia and Slovenia’s declared secession, the Vatican and leading Catholic clerics and politicians of the Catholic Right conducted a war of words against Yugoslavia and the Serbs, who were resisting the destruction of Yugoslavia. At this time (the Summer and Fall of 1991), in order for people in the Yugoslav republics to feel some confidence in defending their country, it was crucial that they see people outside Yugoslavia demanding that their governments oppose Yugoslavia’s destruction. What Buchanan says below was echoed worldwide by leading Catholic clerics (e.g., Cardinal O’Connor in New York) and by the Catholic Right, perhaps most importantly in Germany. Coming in mid-Fall 1991, when there was no longer anything resembling an organized, authentic Left anywhere to counter it, this onslaught had an immense effect on Western public opinion at this crucial moment, when Yugoslavia was being broken in two, setting the stage for the further shattering that was to come. Croatia is not some faraway desert emirate. It is a “piece of the continent, a part of the main,” a Western republic that belonged to the Hapsburg Empire and was for centuries first line of defense of Christian Europe. For their ceaseless resistance to the Ottoman Turks, Croatia was proclaimed by Pope Leo X to be the “Antemurale Christiantatis,” [sic! Should be ‘Christianitatis’] the bulwark of Christianity. But the New Europe is about money, not faith, and she has turned her back on the pope’s plea to come to the aid of her persecuted brethren. Where are the Germans? Are they so paralyzed by guilt over Hitler’s crimes they cannot order up a couple of divisions to chase Milosevic’s army back to Belgrade? Would it not be a triumph for the West and freedom if a German army were seen driving to the rescue and liberation of a beleaguered Balkan people, as French and Italian warships broke the Dubrovnik blockade? After decades of tutelage and probation, it is time Germany assumed the duties that come with being the greatest free nation in Europe. – “Western leaders Fiddle While Croatia Burns,” by nationally syndicated columnist Pat Buchanan. Chicago Tribune Service, November 12, 1991. This article was published in major newspapers throughout the U.S.
55:34 – Jared Israel: Now, that picture was shown all over Croatia. I have a picture of two years ago of the pope meeting with Đapić [pronounced ‘Japich’; ‘j’ as in ‘judge’], who is the head of the Party of Rights, you know, the descendant of Starčević and Pavelić , embracing him because he had a gallbladder operation. A special aide to the pope was sent to the town that Đapić was mayor of and brought him to the Vatican, and then this was shown all over Croatian television. The old fascist marching songs were sung, a moment of silence was observed for all who died defending the fatherland, and the gathering was reminded that today was the 57th anniversary of the founding of Croatia’s Nazi-allied wartime government. Then came the most chilling words of the afternoon. “For Home!” shouted Anto Dapic [sic – should be Djapić or Đapić], surrounded by bodyguards in black suits and crew cuts. “Ready!” responded the crowd of 500 supporters, their arms rising in a stiff Nazi salute. The call and response – the Croatian equivalent of “Sieg!” “Heil!” – was the wartime greeting used by supporters of the fascist Independent State of Croatia, which governed the country for most the Second World War and murdered hundreds of thousands of Jews, Serbs [and most Roma!] and Croatian resistance fighters. 56:05 – Jared Israel: Now, these messages to ordinary people are not lost on them. If you like our work, please help make it possible by donating to Emperor's Clothes! Since this Civiltà Cattolica article, quoted below, is a vicious attack on Jews – one of many such attacks by La Civiltà Cattolica over the past century and a half – let us clearly state: contrary to what La Civiltà Cattolica claims, the Talmud never incites Jews against non-Jews and never argues that it is OK to mistreat non-Jews, or anything of the kind. The Civiltà Cattolica slander quoted below was part of a campaign aimed at a) indoctrinating ordinary people to believe their problems (indeed all problems) were caused by ‘the Jews,’ laying the basis for them to support the worst anti-democrats, who demagogically played on fear and hatred of Jews, and b) legitimizing violence against Jews and anyone else who said Jewish people deserve normal human rights. Here is the English translation of the first page of this nine page article, followed by the original Italian text. Thanks go to Michelle R. for locating and scanning this and other Civiltà Cattolica texts. [Title:] ROME (Our correspondence) — Of Jewish hate both theoretical and practical against the non-Jewish human race. How Jewish law now is contained not in the Bible but solely in the Talmud. How much therefore it is necessary for everyone to know what the Talmud commands the Jews against the non-Jews. ROMA (Nostra corrispondenza) — Dell’odio ebreo sì teorico e sì pratico contro il genere umano non ebreo. Come la legge ebrea non si contenga ora nella Bibbia ma nel solo Talmud. Quanto perciò sia necessario che tutti conoscano ciò che il Talmud comanda agli ebrei contro i non ebrei. “The Pope’s visit can be seen as support for Croatia in the light of pressures by the international community, those circles that do not favour the independence of Croatia, a country supportive of the principles which the Catholic Church and the Vatican preach and advocate,” Tudjman said. He described the beatification of Cardinal Stepinac and the arrival of Pope John Paul II as a backing of the democratic Croatia in which the Catholic Church has a full opportunity to work in the spirit of its principles and to the benefit of the people within which it lives. “Article 24: This Organization [i.e., the Palestine Liberation Organization – PLO] does not exercise any territorial sovereignty over the West Bank in the Hashemite Kingdom of Jordan, on the Gaza Strip or in the Himmah Area. Its activities will be on the national popular level in the liberational, organizational, political and financial fields”. In case you are not familiar with these names, Ante Starčević was the founder of a Croatian nationalist movement that, disastrously for Yugoslavia, based its appeal on the propagation of a) hatred (especially of Serbs) and b) a fantasy history of Croatia. Starčević co-founded the Croatian Party of Rights (the “rights” were those of the Croatian state, not of ordinary people), which was later led by Ante Pavelić, giving birth to the Croatian Ustasha, which, as Nazi Germany’s junior partner, propagated religious hatred as well as Nazi-type mystical racism, while it hacked, shot, burned and tortured its way through the Serbian, Jewish and Roma populations of Croatia, the Krajina and Bosnia during World War II. OSIJEK Predsjednik HSP-a i gradonačelnik Osijeka Anto Đapić na Klinici za kirurgiju Kliničke bolnice Osijek danas će biti operiran, odnosno bit će mu izvađeni žučni kamenci. U bolnicu je primljen jučer kako bi se obavile sve pripremne radnje za operaciju, koju će obaviti ugledni osječki kirurg prim. dr. Damir Kovačić. Đapić je, pak, neposredno prije odlaska u bolnicu, za boravka u Rimu bio na općoj audijenciji kod Svetog Oca Benedikta XVI. Papi je tom prigodom predao sliku Ivana Lackovića Croate “Zima” te ga pozvao da posjeti Osijek i Hrvatsku. Note: Vecernji List misspelled the name of Archbishop Antonio Tricarico, the Official of the Vatican Secretariat of State, emeritus, who escorted Đapić from Osijek to Rome. Emperor’s Clothes Needs Your Help.